If you’ve granted permission to a ton of apps and sites on your personal accounts, it can be quite a hassle trying to figure out where to go to revoke access and delete those apps. Created by Israel-based entrepreneur Avi Charkham, who is also the co-founder of Familio, MyPermissions.org is a simple little site that takes the hard work out of that process. 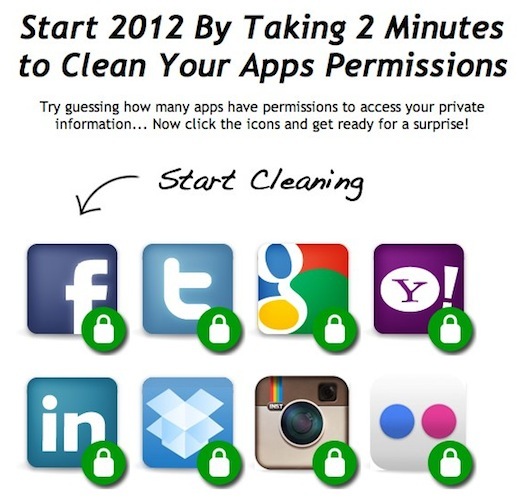 With direct links to your Facebook, Twitter, Google, Yahoo, LinkedIn, Dropbox, Instagram and Flickr accounts, you really have no excuse for putting off the chore of cleaning up your app permissions, and what better time to do it than at the beginning of the year, when you’ve probably pledged to be a little bit more organized. MyPermissions is a simple concept but it definitely achieves what it sets out to do. Best of all – you don’t actually have to grant the site access to your accounts in order to use it. The page acts as an online bookmark, and as long as you’re logged in to your accounts, all you have to do is click the link of any given service and you’ll be taken straight to your app permissions page. When you first use the service, you’ll probably be surprised to find just how many apps you’ve granted access to your accounts. It may seem harmless that all of those apps have direct access to your private accounts, and for the most part it is. But with the growing stories of services being hacked, and personal information being released, you’re better safe than sorry. MyPermissions also recommends using IFTTT to get a monthly email reminder to check your app permissions, so you can keep your accounts neat and tidy all year round.